A trio of lettings to tech companies at The Base is proof that Warrington’s position between Manchester and Liverpool – for years a major factor in its growth – can continue to sustain and grow the town as Britain’s economy changes. That’s the view of Steve Park, managing director of Warrington & Co, the council’s public-private sector regeneration arm. He says that easy rail and road links into Warrington from its bigger neighbours is helping tech-led businesses such as Cube32 Studios and DAT Draughting Services attract and retain the skilled staff that they need. 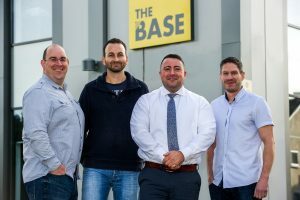 The three new occupiers at The Base on Dallam Lane, which also includes JSA Design, take the number of tech and engineering occupiers at the space to 16. More than 130 staff now work in the 50,000 sq ft grade A office, which is managed by Langtree on behalf of Warrington & Co.
At a recent presentation at The Base by Siemens’ chief technology officer, Alan Norbury, the audience heard that technology-led manufacturing companies could expect to see a 30% boost to productivity as the ‘fourth industrial revolution’ took hold. He predicted a significant boost for the north west, with its strong cohort of advanced manufacturers.